Grosgrain: Magpie Lovely $50 Gift Card GUEST GIVEAWAY!!!! CLOSED. Magpie Lovely $50 Gift Card GUEST GIVEAWAY!!!! CLOSED. You may have seen my recent post about Magpie Lovely. Well, you were right. I was buttering you up so that you could be extra excited about today's giveaway sponsored by, of course, Magpie Lovely. Here is one of her newest selections by designer Eliza and Axel. 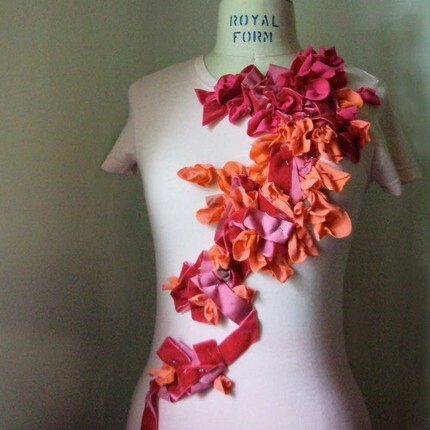 This light pink, dip dyed tee features flowing petals and ribbons cascading up and down the front of this super soft tee. A walking piece of art! Velvet embellishments. As I mentioned in my previous post. All of Magpie Lovely's items are handmade by various designers. Here's another one of my favorites by designer Mette. This amazingly simple yet gorgeous A-line, linen dress features a handgathered ruffle in front with bias trim and row of buttons. It is classic, feminine and so pretty. Offered in six color choices and is fit by the bust size. I also loved this child's dress. Classic yet modern, this A-line dress is made of lovely linen fabric and features bold color blocks of ivory, brown, ornage and pink. It is fully lined in ivory voile and has an invisible back zipper. 3) By linking and leaving a comment about your favorite item from the store(this will be worth 2 entries which will better your chances of winning)leave comments about the site/their favorite items. Find more info under the FAQ page. And remember, if readers go to the Magpielovely Facebook page and become a fan, they may use the code FB20 to receive 20% off of their orders. I linked! I'd love to have the Flora or Ruffle top! I love that A-line children's dress! So cute! Hi!! I love that little girl's dress. THAT is really cute and I have two little granddaughters 5 and 3 years old and another granddaughter on the way, if they are right. I'd love to win!! Thanks for the opportunity. I don't have a blog though. What a wonderful giveaway! That shirt is GORGEOUS! I like the Ruffle cardigan and the Pirate Skivvies. How stinkin' cute are those undies?! Oooh, shiny! I'm in looove with the Tippa dress, but also really like the one you picked. And, well, the whole shop, really. Thanks for the chance (and for giving us blogless fans a chance, too). I looove the leaf cuff in red. I'll create a link too. I LOVE LOVE LOVE the Flora top!! My daughter would look SO cute in the A-line dress. This top is pretty cute but I really got my eyes set on that sweater skirt - LOVE IT!!! Link!!!!!!! I LOVE ALL OF THESE CLOTHES! I love Magpie Lovely Ruffle Top! Here I am again! Entering another amazing giveaway! I really like the Little Wings necklace, so beautiful. Joanna Ross-linked. Love the first shirt on this post. Looks so creative. I also made a link. Linked to my blog too for an extra entry! I spent an hour yesterday purusing every item on the website. I don't know how I'd pick a favourite! Thanks for the chance! My favorite is the flower bud cardigan for little girls, but it doesn't seem to come in my daughter's size which totally breaks my heart. I also loovee the Ruffled Zip Up Hoodie. I love the baby shoes for sure... how can you get any cuter than that! But I also love the ruffly shirts. They are right up my ally! I LOVE the dress with the ruffle on the front. So subtle and delicate. It would look perfect on my little girl! Love love the shirt. And the dresses!! Really cute stuff. I love the pirate skivvies! I love this especially the cute little girl dress! How in the world can I pick a favorite!? I've been saying lately that i need a neck gaiter, so those are a good practical choice. But I'm addicted to bags, so the Eden that uses Anna Maria's sketchbook fabric is calling to me. But not as much as those birdie clocks. oh, my. thanks for the reco! love the pink fiona tree! I love the ivory cowl! So elegantly classic. i love the shape of the eden bag!! i am drawn to the "chains" fabric. My favorite is the Eden Bag in Orchid Garden. The weather is already starting to warm up here in Vegas, and I'm really wanting to expand my wardrobe (& bags) into brighter, fun colors and patterns. It would be perfect to tote around a few diapers and wipes along with my regular daily needs like keys, wallet, phone, etc. I love so many things! I especially love a simple black shirt dressed up with a vertical row of silk ruffles. I love your stuff!! I am in love with your milk and honey maternity dress. . . and went back and saw it on the new years even sweater you did. SO CUTE!!! Do you have a tutorial for this? I would love it! My favorite item in the store would have to be the Recycled Sweater Skirt! I LOVE that recycled sweater skirt. I love the derss called "Good fortune -dress"! Would be perfect for my daugther! Kellie Morgan- Love the I heart MOM tattoo shirt. I linked. And I really like the aline dress too. So simple but so cute. The linen dress with the ruffles and buttons on front is lovely! I might try and copy it at home in the meantime, just in case I don't win! I love cadence pillow eight with the fine blue lines. So pretty! My favorite is the Sable Dandy Dress for children! I want a matching one in my size! I love so many of their things! Especially the necklaces and clocks! Thanks for a great giveaway! I love the shirt called Leaves. It's orange. I also like the Luscious tangle necklace. i love all of magpie lovely's products! i've put a link on my blog! Anything by Eliza and Axel would be my favorite. I've had them up as a "favorite" on my etsy profile for a long time, but I haven't ordered anything...yet. Soon, I hope! This shop is so lovely! I adore the Dizzy Bracelet. I think I would spend it on those adorable shirts and onesies like the Duck Shirt and Cow Shirt. oooo I love eliza's stuff Ive been drooling over it for ages so would love to win this giveaway! I CANNOT chose a favorite! I love everything! The jewelry, bags, shirts, the baby shoes! Thanks for the chance to go shopping! I am torn between the Chelsea dress and the Rosa dress!!! I LOVE LOVE LOVE both of them!! I LOVE the Chelsea dress. My favorite. I love carey's pick cake art. so adorable! I love the Anthro Neck News necklace. So fun! This necklace! Oh it's beautiful! I also love that the dress is measured by bust size. That's how all dresses should be measured!! I really like the oak leaf cuff and the rustic stack rings. I love, love the flora tee! Ohhhh, there's such lovely jewelry on Magpie lovely. I LOVE the gold rain and nesting necklaces. And the leaf cuff is amazing! Perfect for an outdoorsy girl like me, who dreams of hiking while sitting at my desk at work :-) Thanks for the chance to win! I want to see that dress on my little girl. So cute. So hard to choose a favorite! I like the scarves and screen-printed tees. I love that bottlecap [is it bottle cap?] necklace! and I wish I had a little girl to put into that rainbow dress! you showcase the best things! love this site! I am linked as well as posted!And you're right, you buttered me up the other day and got me thinking "Oh, I would LOVE to have that!!!" on several items! I love this, and you're right, you did get me all buttered up! I was drooling over this website when you mentioned it the other day! It would be fabulous to win a gift card! Thanks! I like the elegance ruffel tank! I love the Cierra dress!!! I would love one for my granddaughter! I love the Cierra dress!!!! I would love this for my granddaughter! Oh my, my favorite is New School Schoolgirl Smock!!! Love it! I love the little girl's MALIYA peasant-style dress! LOVE all of the ruffled tops!! Maybe the Modern Elegance one if I had to pick?? Hard choice! This is really adorable! Thanks for highlighting Magpie Lovely. and my fav. thing is that beautiful ruffle flower thing up top :D awesomeness. I love the little girls posey dress. what a cutie. I would love the baby ladybug shoes for my daughter. Adorable! ooo i think i'll go with the ruffled elegance tank!! It would be a tough decision as what to purchase-there are so many lovely choices. One item I like is the Simplicity Totes. Love the Flora Tee or the Ruffle Blouse. I la la L-O-V-E MAGPIE Lovely! I love the Flora top and the recycled sweater skirt! The Flower Bud Cardigan is beautiful and so refined for little ones! Firstly, thank you for sharing this website with us!! I adore it; for the holidays we have fully embraced this concept of shopping ~community/eco-chic/ artist inspired & supported. I love the women's linen dress! i love all their goods... but i think my most favorite is the flora tee, probably in white or black. I love the Sweet Pleat girl's dress!!! So cute. I like the Eden Bag Branching Out. I LOVE THE ROSA DRESS! I LOVE the ruffle cardigan. The kind of thing I love to look at, but am too practical to buy for myself. :o)! Magpie Lovely is so lovely indeed. I especially love the women's bird necklaces. hmmm...i can't deside between the flora or fiona tees! I just love all the jewelry!!! The Flora Tee is my favorite. Thanks for the giveaway! I love all their dresses!! My favorite is The Lena Dress!! I linked on my blog! Hope I can win!! I'd die for the Urban flower tunic: so chic and so modern at the same time. What wonderful designs! I'm not sure what I'd choose. I love the girls dresses especially the Tippa and Chelsea dress. And those bobby pins are adorable! i love the "Decorate Your Own Cake"
i love the Ruffle Tee in black! I created a link and checked out Magpie Lovely's site. Loving the Flora Tee. Sweet! Hope it's not too late to enter. Cute cute things. I love the site! Great! I LOVE the Garden Party necklace pictured. So classic! I ♥ the linen dress...its adorable! I don't know when this ends, but I'll enter anyway. I like the Edgar The Elephant. I also created a link, but I don't know if it worked. This is where it is. I like the Big Brown Bird necklace! oh i'm obsessed with the ruffle cardigan!!! so beautiful! I LOVE the Simplicity Tote!! Cool site, love the tuxedo top! all those ruffle tees are GOR-geous!!! oh - do we really have to pick one favorite? The A-line dress & sweater skirts are both fabulous - thanks for the chance to win! I love the Big Brown Bird necklace! I love the ruffled elegance tank the best, but several of the handbags were calling my name!! absolutly a gorgeous shop. i love it all! 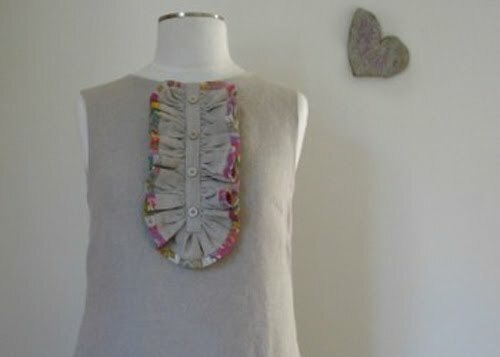 I am covering the ruffle neck tee in the light grey shade shown on the website. I am trying to figure out how to create something like that myself, but I think it's beyond my skill level. Lovely, absolutely adore the jewelry! I love all the little girl dresses, especially the Chelsea dress you chose, the Pop dress, the Lumi... but my daughter's favourite would be the Hana dress. I can already imagine her saying "I'm a butterfly, bacause I have butterflies on my dress!" Love that necklace. So beautiful! I love the "sailing away" cardigan.. so creative & cute! Thanks for having all these giveaways! I love the Modern Elegance tank, lovely AND comfortable, and also the Oracle necklace. I can see both of them being dressed up or down wonderfully. Thanks! My favorite is the Pink Flower Tote. It's so fun and Springy!